Greetings, everybody, it’s Andy Gesner from HIP Video Promo, here with brand new music from one of the world’s most enduring and popular electronic bands. Anybody who has seen the movie “Trainspotting” is familiar with Underworld. “Born Slippy,” a slow-building synthpop stunner with inspired stream-of-consciousness lyrics, will forever be associated with the film. The group’s 1994 setdubnobasswithmyheadman is universally recognized as a cornerstone of contemporary electronic music and helped define the genre; subsequent releases, such as the ’00 live set Everything Everything, demonstrated that Underworld played by nobody’s rules but their own. 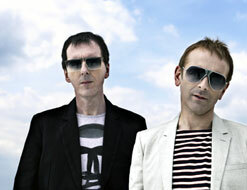 Pop stars in the U.K. and on the European continent, Underworld are the rare electro group to boast a mass following in the United States: they’ve been regular visitors to the Billboard dance charts. All of this is merely to say that when Underworld puts out a new song or a new album, it’s a worldwide occasion. Barking, their upcoming full-length, promises to extend a winning streak that began in the mid-’80s. (Check out the release page here: “Always Loved A Film,” the lead single from Barking, offers the same kind of appealing experimentation — and the same hypnotic synth textures and intriguing lyrics — that we’ve come to expect from Underworld. The production team of Mark Knight and Dean “D. Ramirez” Marriott, who collaborated with Underworld singer Karl Hyde on last year’s invigorating “Downpipe,” have pushed the legendary electro group toward something simultaneously danceable and house-rocking. “Always Loved A Film” is a bracing fusion of house, drum ‘n’ bass, vintage techno, and alt-rock; it’s also catchy as hell. Hyde and partner Rick Smith have made some stunning clips over the years. Their spot for “Two Months Off” is a relentless, dizzying trip: it captures a bizarre flight through a rainbow-dappled forest. The “Always Loved A Film” video is a bit more lighthearted, but no less arresting. The clip follows the misadventures of a team of skateboard hoodlums as their antics become increasingly destructive. The twist? These four bad boys aren’t boys at all — they’re middle-aged. They’ve got teenage appetites, though, and the self-destructiveness to match. Their recklessness with their skateboards would put high-school daredevils to shame: we watch them leap, skid, awkwardly attempt tricks to impress the (also middle-aged) ladies, and occasionally fall on their backsides. Cruising around a shore town in their convertible, they’re no less wild — they vandalize property, trespass in private swimming pools, urinate on walls, pop champagne bottles, and harass passersby. When a highway patrolman ends up in the boot of the car, it’s an escalation, but not an entirely unexpected one. The ringleader of this gang of silver foxes is a fiftyish rake with a devilish smile who looks like he ought to be playing pinochle in a corner club. Instead, he instigates bar fights. In a strange sort of way, it’s uplifting. We’re very excited to be working once with the good folks at Om Records once again to bring you this excellent new clip. We’re here to hook you up with all things Underworld so don’t be shy about getting in touch! If you need more info, call Andy Gesner at 732-613-1779 or e-mail us at HIPVideo@aol.com. You can also visit www.Om-Records.com or www.UnderworldLive.com to find out more about Underworld.